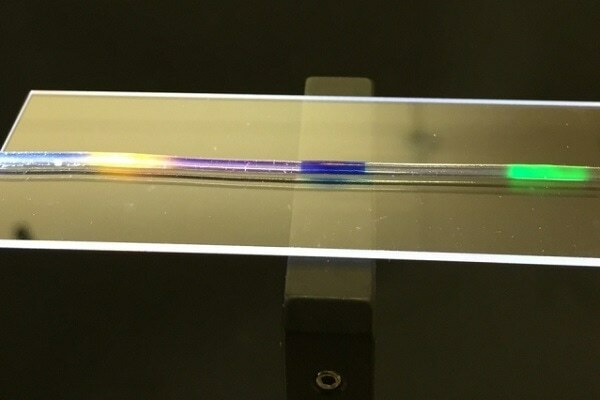 Researchers from MIT and Harvard Medical School have developed a biocompatible and highly stretchable optical fiber made from hydrogel — an elastic, rubbery material composed mostly of water. The fiber, which is as bendable as a rope of licorice, may one day be implanted in the body to deliver therapeutic pulses of light or light up at the first sign of disease. The researchers say the fiber may serve as a long-lasting implant that would bend and twist with the body without breaking down. The team has published its results online in the journalAdvanced Materials. But the brain is like a bowl of Jell-O, whereas these fibers are like glass — very rigid, which can possibly damage brain tissues. If these fibers could match the flexibility and softness of the brain, they could provide long-term more effective stimulation and therapy. Getting to the core of it..
Zhao’s group at MIT, including graduate students Xinyue Liu and Hyunwoo Yuk, specializes in tuning the mechanical properties of hydrogels. The researchers have devised multiple recipes for making tough yet pliable hydrogels out of various biopolymers. The team has also come up with ways to bond hydrogels with various surfaces such as metallic sensors and LEDs, to create stretchable electronics. The researchers only thought to explore hydrogel’s use in optical fibers after conversations with the bio-optics group at Harvard Medical School, led by Associate Professor Seok-Hyun (Andy) Yun. Yun’s group had previously fabricated an optical fiber from hydrogel material that successfully transmitted light through the fiber. However, the material broke apart when bent or slightly stretched. Zhao’s hydrogels, in contrast, could stretch and bend like taffy. The two groups joined efforts and looked for ways to incorporate Zhao’s hydrogel into Yun’s optical fiber design. If these two things are too similar, whatever light source flows through the fiber will just fade away. In optical fibers, people want to have a much higher refractive index in the core, versus cladding, so that when light goes through the core, it bounces off the interface of the cladding and stays within the core. When you stretch a certain portion of the fiber, the dimensions of that part of the fiber changes, along with the amount of light that region absorbs and scatters, so in this way, the fiber can serve as a sensor of strain.